Goals. What are your goals? Are you looking to diminish fine lines and wrinkles? Is getting rid of stretch marks your goal? Do you want to lose weight? Do you want a non invasive cosmetic procedure that will fade with time or are your looking for a more permanent fix? Ask yourself some basic questions, and write down your thoughts in order to narrow down your goals. The more specific you can get, the better able you’ll be able to decide which procedure is for you. Recovery time. Our lives are incredibly busy and finding time for a non invasive cosmetic procedure can be challenging when the recovery time involves minimal activity and no exposure to the sun for a set amount of time. Decide how much time you’re willing to take off work to recover and if you’ll need support at home after your procedure. If you find you don’t have a lot of time, your non invasive cosmetic procedure list can narrow even more. Pain. Some non invasive cosmetic procedures have no pain; others have some. 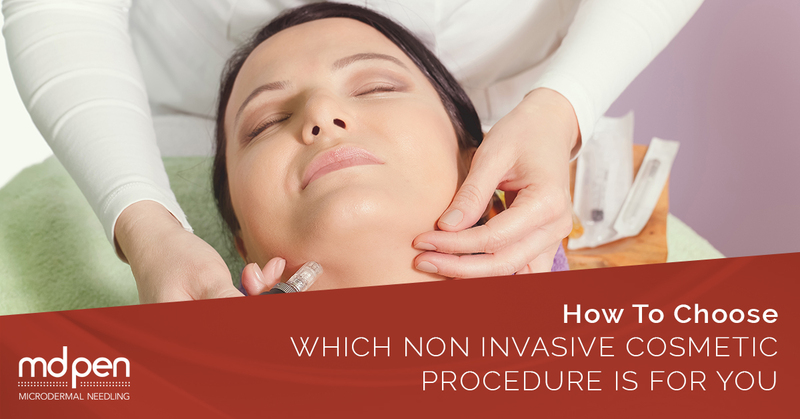 Decide if the results you are seeking for a non invasive cosmetic procedure is worth the possible pain that may be involved in achieving those results. Financial cost. There is a huge discrepancy in the costs of non invasive cosmetic procedures. There are many that offer similar results (such as microneedling, dermal fillers, and Vampire Facial®), but all fall on different sides of the financial spectrum. Narrow down which procedures will give you what you are seeking, and then drill down into each one, weighing individual factors, such as financial costs. One word of caution: this does not mean finding a practitioner who will perform the same non invasive cosmetic procedure for less, especially if it’s significantly less. When it comes to altering your body — even in minor ways such as with non invasive surgical procedures — you want to make sure your medical practitioner is licensed and reputable. Often, when you discover a huge discrepancy in the same procedure costing less, it’s because the practice is cutting corners or using unconventional tactics that you want no part of. The same non invasive cosmetic procedure should cost about the same with every practitioner you investigate. Emotional weight. When you don’t feel good about how you look, all areas of your life is affected. You have low self-esteem, low self-confidence, and are generally reserved both in life and in decision-making. You may also be a bit depressed. Known as the trickle-down effect in the beauty industry, when positive changes occur in how you look, these changes trickle down in all aspects of your life. We see this most often in those who lose weight. Suddenly, all areas of their lives are improved. When you look good, you feel good, which changes your mindset, and hence, all other aspects of your life. When considering which non invasive cosmetic procedure to have, take into account any emotional weight you might be bearing. You might want to spend a little more financially in order to achieve the results you truly want to lift your emotional baggage because (let’s be honest) our emotional baggage can be heavy. Cosmetic surgery and procedures of any kind are elective; none are necessary for survival. That being said, our battles may not be completely of an external factor; often, our battles are internal. In the end when deciding which non invasive cosmetic procedure is for you, consider the difference it will make in your life. This is one time it’s okay to be selfish, especially if you’re insecure, lacking confidence, or feeling ashamed about how you look or a part of your body you wish were different. You’re the one who has to live with your body and how it looks. You’re the one who looks in the mirror and sees something different than everyone else. And you’re the one you have to please, and no one else. MDPen supports microneedling practitioners for one simple reason: they are on the front lines of changing people’s lives every day. Every non invasive cosmetic microneedling procedure they perform affects a life. And that one life extends to every person that person touches: family, kids, spouse, friends, and work colleagues. Microneedling is a non invasive surgical procedure that utilizes tiny, micro injuries to your skin through a microneedling pen that stimulates your skin to heal itself. This healing process tightens your skin and produces new skin, thus helping to eliminate the signs of aging, sagging skin, acne scarring, stretch marks, and baldness. Microneedling is cost effective with minimal downtime and offers incredible results for patients, possibly relieving emotional baggage. In 2019, MDPen recognizes that you have many options. Microneedling may not be for you and your situation. However, microneedling is just one of many non invasive cosmetic procedures to consider in your search for the right procedure for you. To find out more, visit our news page and Facebook page. We post videos of our procedures, as well as very informative articles that may help you in your decision. We offer a list of practitioners for you to find the nearest MDPen licensed microneedling practitioner near you. Practitioners can also be a wealth of information as you weigh your options. Most offer free consultations for you to ask questions and determine if a fit is right for you. MDPen understands it can be hard to determine which non invasive cosmetic procedure is right for you. Luckily, you have options. Visit us today!